For other uses, see Shape of Things to Come. A long economic slump causes a major war that leaves Europe devastated and threatened by plague. The nations with the strongest air-forces set up a benevolent dictatorship that paves the way for world peace by abolishing national divisions, enforcing the English language, promoting scientific learning and outlawing religion. The enlightened world-citizens are able to depose the dictators peacefully, and go on to breed a new race of super-talents, able to maintain a permanent utopia. Some of Wells’ short-term predictions would come true, notably the aerial bombing of whole cities and the eventual development of weapons of mass destruction. Others, such as the withering of state-power and the dissolution of Islam were wide off the mark. Today and Tomorrow: The Age of Frustration Dawns – The history of the world up to 1933. The Days After Tomorrow: The Age of Frustration – 1933–1960. The World Renaissance: The Birth of the Modern State – 1960–1978. The Modern State Militant – 1978–2059. The Modern State in Control of Life – 2059 to New Year's Day 2106. The Shape of Things to Come was written as a future history. In late 1933 or early 1934, US President Franklin D. Roosevelt's failure to implement the New Deal and revive the US economy and Adolf Hitler's failure to revive the German economy by rearmament causes the worldwide economic crisis to continue for thirty years, concurrently with the war, as described above. Wells predicted a Second World War breaking out with a European conflagration from the flashpoint of a violent clash between Germans and Poles at Danzig. Wells set the date for this as January 1940 – quite close to the actual date of September 1939. But where Wells' imagined war sharply diverges from the actual WWII is in Poland proving a military match for Germany – and they engage in an inconclusive war lasting ten years. More countries are eventually dragged into the fighting, but France and the Soviet Union are only marginally involved, the United Kingdom remains neutral, and the United States fights inconclusively with Japan. The Austrian Anschluss happens during, rather than before, the war. Czechoslovakia avoids German occupation and its president, Edvard Beneš, survives to initiate the final "Suspension of Hostilities" in 1950. Wells' prediction was widely off the mark with regard to Spain, which the book assumed would manage to stay away from the violent passions sweeping the rest of Europe – where in fact the Spanish Civil War would become the main focus of these passions, two years after Shape of Things to Come was published. Evidently, Wells greatly overestimated the influence of Spanish Liberals such as Unamuno on Spanish society as a whole. Wells correctly predicted that the coming war would involve both sides launching heavy bombings of each other's main cities (his detailed depiction of the destroyed Unter Den Linden closely predicted the boulevard's actual fate in the war). However, Wells was wrong in assuming that land fighting would quickly bog down as in World War I, and that the idea of using tanks to develop a war of movement would come to naught. Wells predicted that submarines would become the launching pads for "air torpedos" (i.e. missiles) carrying weapons of mass destruction, enabling a country to threaten the destruction of places halfway around the world – which actually happened, though not in World War II but decades later. Wells' predicted war ends with no victor but total exhaustion, collapse and disintegration of all the fighting states and of the neutral countries, equally affected by the deepening economic crisis. The whole world descends into chaos: nearly all governments break down, and a devastating plague in 1956 and 1957 kills a large part of humanity and almost destroys civilisation. Wells then envisages a benevolent dictatorship, "The Dictatorship of the Air", arising from the controllers of the world's surviving transport systems, who are the only people with global power. This dictatorship promotes science, enforces Basic English as a global lingua franca and eradicates all religions, setting the world on the road to a peaceful utopia. When the dictatorship chooses to murder a subject, the condemned person is given a chance to take a poison tablet (modeled on the Hemlock given to Socrates). The achievement of a classless society is not via a Marxist Dictatorship of the Proletariat, an idea which Wells completely rejected. Rather, the working class is massively "pulled upwards" and completely eliminated in several generations of intensive upward social mobility – in effect leaving a humanity entirely composed of "middle class intellectuals". The limited amount of physical labor still needed is performed by the world's youths, undergoing two years of "labor conscription" instead of the no longer needed military conscription. Eventually, after about 100 years of reshaping humanity, the Dictatorship of the Air is overthrown in a completely bloodless coup, the former rulers are sent into a very honourable retirement, and the world state "withers away". The last part of the book is a detailed description of the utopian world that emerges. The ultimate aim of this utopian world is to produce a world society composed entirely of polymaths, each and every one of its members the intellectual equal of the greatest geniuses of the past. The book displays one of the earliest uses of the abbreviation "C.E. ", which Wells explains as "Christian Era", but it is now more usually understood as "Common Era". One of the major aspects of the creation of the World State is the abolition of all organised religion—an act deemed indispensable to give the emerging "Modern State" a monopoly over education and the complete ability to mould new generations of humanity. The abolition of Islam is carried out by the Air Police, who "descend upon Mecca and close down the main holy places", apparently without major incident. Eventually, Islam disappears, its demise accelerated by the decay of Arabic and its replacement by "an expanded English". Some twenty mosques survive, deemed to be worthy of preservation on architectural grounds. The Lebanese-American scholar George Nasser remarked on this aspect of Wells' book: "In the 1979 imagined by HG Wells, a self-appointed ruling elite composed mainly of Westerners, with one Chinese and one Black African and not a single Arab member, would establish itself in the Arab and Muslim city of Basra and calmly take the decision to completely extinguish and extirpate the Muslim religion... In the 1979 of real history, Khomeini's Islamic Republic of Iran came into being". There is only a brief reference to the abolition of Buddhism and no reference to any serious problem encountered by the Modern State in eradicating it from East Asia. The most prolonged and formidable religious opposition envisaged by Wells is from the Catholic Church. (There is little reference to Protestants.) The Pope and the entire Catholic hierarchy are gassed unconscious when blessing the new aircraft built by a revived Fascist Italy. After the Catholic Church is decisively crushed in Italy, it finds refuge in Ireland, "the last bastion of Christianity". Ireland is also subdued, and then Catholic resistance is maintained only in Latin America, under "a coloured Pope in Pernambuco", until it too is finally put down. Wells gives considerable attention to the fate of the Jews. In this history, an enfeebled Nazi Germany is incapable of systematic murder on the scale of the Holocaust. However, Jews greatly suffer from "unorganized" persecution, and there is a reference to anti-Jewish pogroms happening "everywhere in Europe" during the chaotic 1950s. Then, in a world where all nation-states are a doomed anachronism, Zionism and its ambition to create a new state come to naught. In the later struggle between the emerging world state and its opponents, Jews are seen as caught between the hammer and the anvil. Following the launch of its antireligious campaign, the Modern State closes down all kosher butcheries still in operation, while the opening act of the "Federated Nationalist" rebels opposing this state is to perpetrate a pogrom against Jews in the Frankfurt area. Eventually, in Wells's vision, it is the Modern State's forced assimilation that triumphs and the Jews, who had resisted earlier such pressures, become completely absorbed in the general society and lose their separate identity. In the 1930s, especially after the collapse of the Weimar Republic and the rise of Nazi Germany, the survival of European Democracy seemed in doubt. Wells - not a great supporter of Democracy even in its more robust times - clearly shared this outlook. The future history book, from the vantage point of 2106, notes that at the outbreak of war in 1940 France was still a Parliamentary Democracy - the implication clearly being that that was an outmoded form of government, on its way out. The visionary Gustave de Windt, setting out the blueprint for the coming "Modern State", rejects categorically "The Principle of Opposition" - which by definition rules out Parliamentary Democracy. Wells' posterity remembers Fascism more as a ridiculous and stupid movement than as a horrible one. In the war envisioned in the book, an enfeebled Nazi Germany got bogged down in its war with Poland, never achieved vast conquests nor engaged in a systematic murder of Jews, and finally collapsed and disintegrated (no mention is made of Hitler's ultimate fate, and the historian of 2106 clearly considers it unimportant). German Nazism disappears without a trace, and an attempt to revive Italian Fascism is easily swept away by the resurgent Modern State. The book notes that many people who were Fascists or Nazis in their early years had become staunch adherents of the Modern State in the more mature part of their lives. This posterity remembers Stalin as having been narrow and limited in his understanding, but not as a bloody dictator. The Soviet Union is less affected than other countries by the worldwide chaos and disintegration of the late 1940s and the 1950s. With the rise of the Modern State, Russia experiences a bloodless takeover by the pilots and other skilled technicians, who displace the Communist Party bureaucrats and eagerly assimilate into the new worldwide state. In the transition time, the old Hammer and Sickle is displayed side by side with the Modern State's Winged Disk. Altogether, of the three competing systems of government - Democracy, Fascism and Communism - only the last would be remembered by Wells' Modern State as having been to some degree a predecessor of itself. 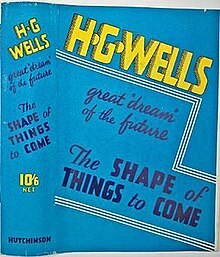 The Shape of Things to Come was published two years after Aldous Huxley's Brave New World. The two share the same basic outline of humanity's future – i.e., a massive war leaves the world in ruins, a self-appointed elite takes over, rebuilds the world and engages in very thorough social engineering to completely refashion human society. Wells explicitly acknowledges this relationship in the book itself; when the future history book discusses the "Dictatorship of the Air" and its leadership, it is noted that "As Aldous Huxley, one of the most brilliant of the reactionary writers, foretold of them, they tidied up the world". The crucial difference is in the kind of future society built up in the two books. The future society envisioned by Huxley is rigidly hierarchical, divided into five psychologically-conditioned classes, ranging from the highly intelligent and assertive Alphas on top to the subservient and moronic Epsilons at the bottom. As Huxley's cynical administrator Mustafa Mond asserts, such moronic underclasses are absolutely essential as society's "gyroscope" – since a society composed entirely of the intelligent and assertive "Alphas" would inevitably collapse in all-out conflict, as each of its members would seek to improve his or her position at the expense of the others. It was this vision which, in Wells' view, would cause Huxley to be remembered by posterity as a "reactionary writer". Much of Shape of Things to Come is devoted to demonstrating that – given a century-long dedicated and intensive work by an elite possessing complete control of world education – such a society of intelligent and assertive "Alphas" could be made harmonious and functional, with no underclasses under them. Wells loosely adapted the novel for the screenplay of the film Things to Come, produced by Alexander Korda and directed by William Cameron Menzies, and released in 1936. It also takes elements from Wells's non-fiction book The Work, Wealth and Happiness of Mankind (1931). The film stars Raymond Massey, Ralph Richardson, Cedric Hardwicke and Margaretta Scott. H. G. Wells' The Shape of Things to Come is a Canadian science fiction motion picture first released in May 1979. Although credited to H. G. Wells, the film takes only its title and some character names from the original source material. The film's plot has no relationship to the events of the book. The film was an attempt to capitalise on the popularity of such recent successes as Star Wars, and TV series such as Space: 1999 and Battlestar Galactica, although the film had only a fraction of the production budget of any of these. Big Finish Productions released a 2017 audio adaptation loosely based on the novel, adapted by Guy Adams, starring Nicola Walker and Sam Troughton and directed by Lisa Bowerman. This version presents events as taking part in an alternate timeline which Raven is shown, rather than the dreams of the original novel. Theodore Wein pointed out that "Wells' Things to Come was at its most influential in the six years between its publication and the moment when the course of its predicted war was overtaken and overshadowed by the actual fast-unfolding events of the Second World War. These same years of the 1930s were the time of incubation for the people who were destined to become the greatest names in Science Fiction, the time when they read ravenously any SF on which they could lay their hands and started to formulate their own ideas. It is not surprising that traces of Things to Come are clearly visible in what they wrote in the 1940s and 1950s." Among such great names of Golden Age Science Fiction, Wein noted Isaac Asimov, Robert Heinlein and Poul Anderson, and he enumerated in the work of all three – as well of some lesser known SF writers – some influences which could be traced to "Things to Come". Rex Warner's dystopian novel The Aerodrome (1941) is partly a fictional critique of The Shape of Things to Come, with Wells' "Air Police" transformed into the fascistic "Airmen". Wells depicted the European social scientist Gustave De Windt sitting down at the British Museum Library and setting out the precise blueprint for a transformation of the world which he would not live to see. This, in Theodore Wein's opinion, may have inspired Hari Seldon, Isaac Asimov's well-known character. Wein noted: "Wells' De Windt, conducting his library research in London, capital of the declining British Empire, realized that the world was about to fall apart, and set out a detailed blueprint of how to put it together again. The bulk of Wells's book details how De Windt's disciples, the Modern State Society, set about implementing De Windt's vision. Asimov's Seldon conducted his library research in the Imperial Library of Trantor, capital of the declining Galactic Empire. He realized that the Galaxy was about to fall apart, and set out a detailed blueprint of how to put it together again. The bulk of Asimov's Foundation Series details how Seldon's disciples, the First Foundation and the Second one, set about implementing Seldon's vision.". Wein also points to Wells' "Encyclopaedic organization which centres upon Barcelona, with its seventeen million active workers" which is tasked with creating "the Fundamental Knowledge System which accumulates, sorts, keeps in order and renders available everything that is known" as a possible inspiration for Asimov's Encyclopedia Galactica, whose compilation was the original task of the First Foundation and quotes from which are sprinkled throughout the Foundation Series. The British Wells had the planes of the emerging World State overfly Washington, D.C. and undermine the authority of the President of the United States. A decade later, the American Robert Heinlein wrote "Solution Unsatisfactory" in which planes of the International Patrol do the same. Later, Heinlein upgraded the International Patrol into an Interplanetary Patrol, a self-appointed elite of highly motivated and rather puritanical spacemen reminiscent of those enforcing Wells' "Dictatorship of the Air". Wells depicted "Federated Nationalists" who had banded together only so that they could fly at each other's throats once they had smashed the budding world government. Poul Anderson in his early future history, the Psychotechnic League, depicted precisely the same kind of Nationalists violently opposing the United Nations' efforts to make itself a true world government and rebuild the war-torn world. ^ Wells, HG, "Introduction", The Shape of Things to Come, Project Gutenberg Australia, §1. A Chronological Note . ^ Nasser, Dr. George, "The Long Tortuous and Arrogant Road to 9/11, pp. 4–5", in Wheatley, Barbara (ed. ), The West and Islam, Islam and the West: Confrontation or Accommodation? . ^ "The Shape of Things to Come". The New York Times. Retrieved 23 March 2011. ^ Wein, Theodore, "1", HG Wells and the Golden Age of Science Fiction, p. 5,7 .